Samuli is the Sr. Associate for the United Nations program at CIVIC. He has over five years of experience in peacekeeping and international operations, with focus on military peacekeeping and gender. He has been deployed in field operations as a soldier in Kosovo and as a gender adviser in Afghanistan. He has also worked for the UN Department of Peacekeeping Operations and the government of Finland. His work has involved development of policies, guidelines and trainings regarding gender integration, as well as developing policies and projects to help integrate women into Afghan Special Security Forces. 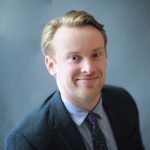 Samuli holds an LLM from Vrije University Amsterdam, a BA from Tallinn University of Technology, and is currently pursuing a Master in Public Administration in Baruch College.